A tornado impacting the town of Roanoke, Illinois. The climate of Central Illinois is humid continental and the area experiences all four seasons. Snow is common in the winter months and while the counties vary in snowfall rate, most receive about twenty inches of snow annually. With all precipitation combined, most counties receive about 38 inches of rain and snow annually. Severe weather, including tornadoes, is common during the spring and summer months. Rare blizzards can happen in parts of Central Illinois in winter. The weather of Central Illinois affects the crop season as well; droughts can sometimes happen in the summer and fall causing harm to the soybean and corn crops. Central Illinois has a diverse economy consisting of a variety of industries. Agriculture is the most significant industry in the region and ranges in scope from family farms to mass-production farms. Most counties in Central Illinois have an agriculture-based economy. The most common crops are soybeans and corn. County fairs and the Illinois State Fair help to promote agriculture in the region and also offer entertainment. The manufacturing and service industries are also significant. Caterpillar Inc. employs more than 15,000 workers in the region and was formerly headquartered in Peoria. Major insurance provider State Farm Insurance is headquartered in Bloomington. The Illinois government in Springfield is also a major employer of people in the region. Popular tourist sites include the Lincoln Home National Historic Site, the Old State Capitol, and the Abraham Lincoln Presidential Library and Museum. Military makes up a smaller part of the economy, but was much larger until the closing Chanute Air Force Base in 1993. ^ "Domestic Geographic Information". U.S. Board on Geographic Names. Retrieved 2008-11-11. ^ "Map of Lakes in Central Illinois". Google Maps. Retrieved 2008-11-11. ^ "Map of Rivers in Central Illinois". Google Maps. Retrieved 2008-11-11. ^ "Lincoln's New Salem". Lincoln's New Salem. Archived from the original on 2008-10-22. Retrieved 2008-11-12. ^ "Lincoln Home National Historic Site". National Park Service. Retrieved 2008-11-12. ^ "NWR Information". US Fish & Wildlife Service. Retrieved 2008-11-12. ^ a b "Climate information". Midwest Regional Climate Center (MRCC). Archived from the original on 2010-06-13. Retrieved 2008-11-11. ^ Angel, Jim. "Illinois Tornado Data". Illinois State Climatologist Office. Archived from the original on 2008-12-09. Retrieved 2008-11-11. ^ "Illinois Soybean". Illinois Soybean Association Web Site. Retrieved 2008-11-11. ^ "Illinois Watermelon". Illiana Watermellon Association. Retrieved 2008-11-11. ^ "Agriculture in Illinois". Illinois Department of Agriculture. Retrieved 2008-11-11. ^ "Central Illinois Tourism". illinois Department Of Commerce And Economic Opportunity. Retrieved 2008-11-11. ^ "Amtrak Train Service". Amtrak. Retrieved 2008-11-11. 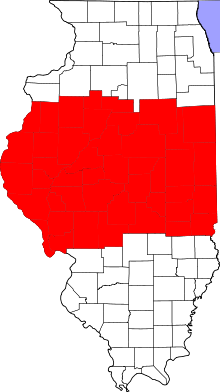 ^ "Map of Interstates in Central Illinois". Google Maps. Retrieved 2008-11-11. ^ "Illinois Road Map". Illinois Department of Transportation (IDOT). Archived from the original on 2011-05-27. Retrieved 2008-11-11. ^ "Interstates located in Illinois". Illinois Department of Transportation (IDOT). Archived from the original on 2013-10-27. Retrieved 2008-11-13.